Here is a useful and educational child's toy that facilitates dexterity and spatial recognition through its personalized, multicolored board puzzle. You can upgrade this gift to include 2 lines for a first and last name or 3 lines to have the puzzle contain first, middle, and last name. Please click on More Images above to see the puzzle with 2 or 3 names. Each puzzle is made in the USA from durable 3/4 inch maple plywood and a handy leather hanging strap for displaying on the wall. All paints and finishes are water based and non toxic. 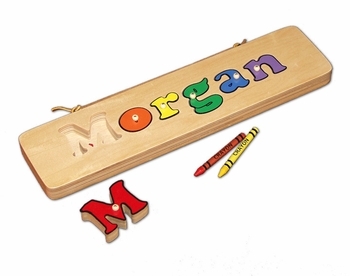 You may also choose to personalize the back of the board with an engraved gift message or the child�s birth information to make this gift even more thoughtful!